I'm currently working on a display board for next year's Armies on Parade. I'm currently thinking that I'll be going with a mixed Inquisition/Space Marines/Grey Knights force. 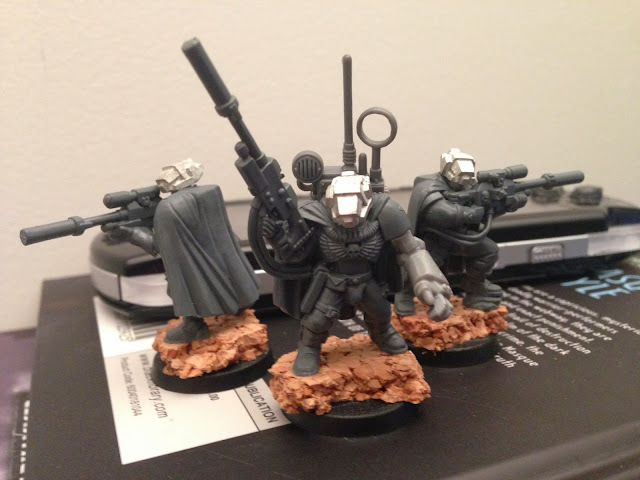 I might also add in the Tau Fire Support Cadre. My worst allies level would be Allies of Convenience. My plan would be to take the Space Marines as Red Hunters. Their Chapter Tactics allows them to be Battle Brothers with Grey Knights if an Inquisitor is present. Everything but the Tau will be converted to match the Deathwatch. I have some of the scout worked out already. They're supposed to be in Deathwatch "Infiltrator" Pattern Scout Armour. This is from the Fantasy Flight Rites of Battle Deathwatch RPG book. I know this won't be competitive at all. My theory on adding the Tau is as follows... The Deathwatch were hunting the Tau when something worse showed up. The Tau, being pragmatic, thought that they might be able to parlay this temporary truce into something more binding. As we all know, the Deathwatch probably fell back onto them moments after the battle was done!